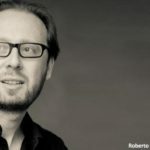 Roberto Prosseda, was born in Latina, Italy, in 1975 and is a leading DECCA artist. 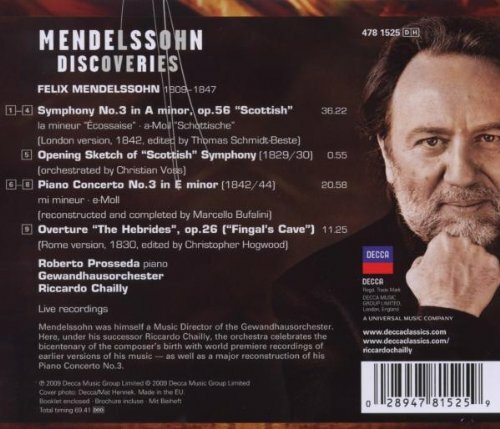 His Decca albums dedicated to Felix Mendelssohn, including the “Piano Concerto No. 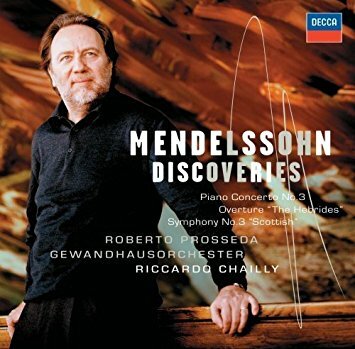 3” with the Gewandhaus Orchestra and Riccardo Chailly, has won much acclaim in the press, including the CHOC from ‘’Le Monde de la Musique Classique’’, the Diapason d'Or and Chamber Music CD of the Month in the UK's Classic FM magazine. In 2010, Deutsche Grammophon selected twelve recordings by Prosseda to add to the box set, "Classic Gold". 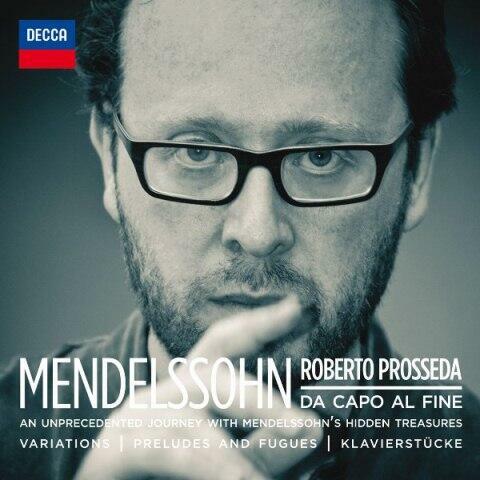 In 2014, Prosseda completed his 10-year project to record all of Mendelssohn's piano works for Decca in 9 CDs. Roberto Prosseda has performed regularly with some of the world's most important orchestras including: the London Philharmonic Orchestra, the New Japan Philharmonic, the Moscow State Philharmonic, the Accademia Santa Cecilia, the Filarmonica della Scala, the Bruxelles Philharmonic, the Residentie Orkest, the Netherlands Symphony, the Berliner Symphoniker, the Staatskapelle Weimar, the Calgary Philharmonic, the Royal Liverpool Philharmonic and the Leipzig Gewandhaus. 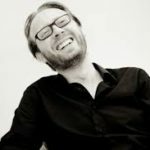 He has performed under the baton of: David Afkham, Marc Albrecht, Christian Arming, Harry Bickett, Oleg Caetani, Riccardo Chailly, Pietari Inkinen, Yannik Nezeit-Seguin, George Pehlivanian, Dennis Russel-Davies, Tugan Sokhiev, Jan Willem de Vriend and Jurai Valcuha. 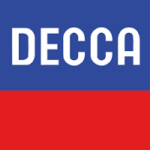 Other than Mendelssohn, whose piano music, Roberto is considered a leading interpreter of today, Prosseda's interpretations of Mozart, Schubert, Schumann and Chopin have been particularly praised, and these composers have in fact featured in Prosseda's recent Decca recordings. 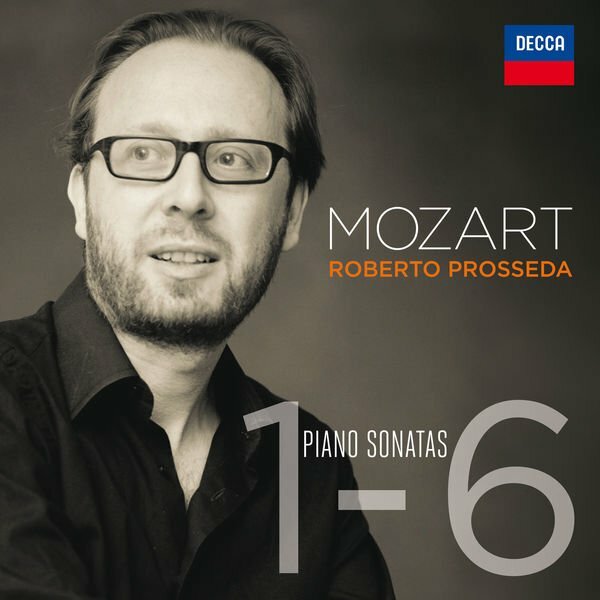 In 2015, Prosseda started a complete recording of Mozart's Piano Sonatas with a modern piano tuned with unequal temperament. An active proponent of Italian music, Prosseda has also recorded the complete piano works of Petrassi and Dallapiccola. 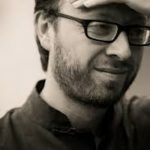 In September 2011, Prosseda made his debut on the pedal piano, performing the “Concerto for Pedal Piano” by Gounod in the world premiere version for the modern instrument. Concerts are planned in the coming seasons on this instrument, rediscovering the original compositions by Robert Schumann, Franz Liszt and Charles Valentin Alkan. 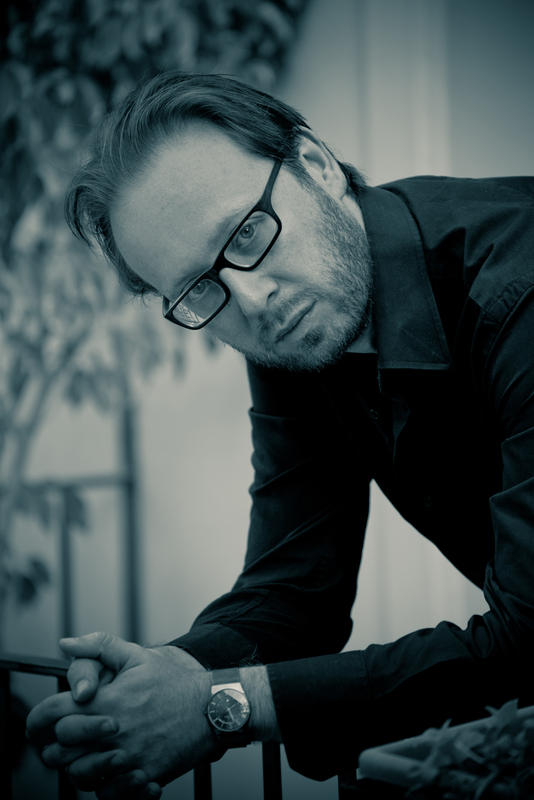 Several composers, including Ennio Morricone, have already written new pieces for pedal piano for Roberto Prosseda, and a recording of Gounod's four pieces for pedal piano and orchestra with the Orchestra della Svizzera Italiana conducted by Howard Shelley, was released on the Hyperion label in Fall 2013. Roberto Prosseda is also very active in musical divulgation. He wrote the book "Il Pianoforte" for Curci Editori (2013), and made three documentaries dedicated to Mendelssohn, Chopin and Liszt (Euroarts). He is currently artistic advisor at Cremona Musica International Exhibitions and president of the Associazione Mendelssohn.